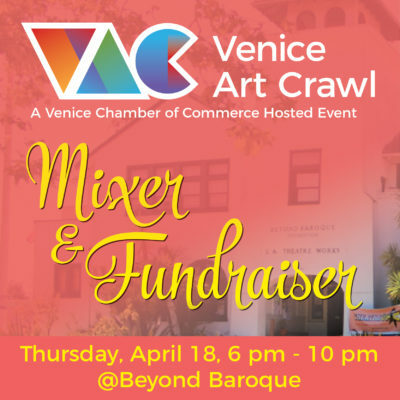 The Venice Art Crawl is a Venice Chamber of Commerce Hosted Event” The VAC’s mission is to preserve the arts in Venice, a place that has historically been known as a vibrant and dynamic art community. Our goal is to share, inspire and promote collaboration within the Venice community through mixers and art events. We are an all-volunteer run non-profit organization which is a committee of the Venice Chamber of Commerce. Local food and drink, an awesome art exhibit by photographer Glen Wilson, screening of “Daughters of the Sexual Revolution” (produced by Carra Greenberg), silent auction, entertainment by Monica Aben, Tom Sless, and poet James Berkowitz, along with an interactive art project called, “The Happening,” by Lauren Doyles. On July 13, 2019, 12 pm – 10 pm on Venice Boulevard the Venice Art Crawl and the Mar Vista Art Walk do a joint art mobility event called the “Get Around” from the Beach to the 405 with 6 hubs all along the route. The Venice Art Crawl will celebrate 9 years in Venice on August 15 with their annual community art event on Park Place (near Brooks) and make sure to get tickets to the special dinner event for that evening. Limited tickets are available. Join our email list. Looking forward to seeing you at the 2019 Venice Art Crawl. Stay connected to the Venice Art Crawl! Select the button below to submit your event. We are accepting event submissions until May 15th for the next Venice Art Crawl. Each VAC banner is $25.00. To purchase your VAC event banner, select the button below. Select the button below to download the most recent VAC Map.